Certification: Successful candidates receive the accredited EFAW or FAW qualification with a covering note confirming the additional +F content covered. If you already hold one of these two qualifications, the additional +F content can be covered in a separate 2 hour training session to give you the first aid skills required according to Forestry Comission First Aid Policy. Please note: The 2 day accredited Outdoor First Aid course might also be your qualification of choice based on your first aid needs assessment if you work outdoors and in forestry. 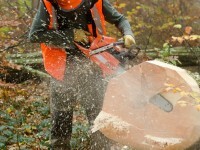 It covers all the content required by current Forestry Commission First Aid Policy (+F) as standard and complies with latest (October 2013) HSE regulations when based on your individual risk assessment.